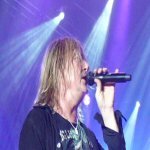 Def Leppard singer Joe Elliott was interviewed yesterday by KOMP 92.3 radio and talked about the second Las Vegas residency. Joe talked about the Down 'n' Outz, the Summer Tour 2014 with KISS, the VIVA! Hysteria residency, returning to play Pyromania, NFL appearance at Wembley Stadium, his stage clothes and Vivian's health. Joe last commented on the second residency plans in August during another interview. Listen to the full 21 minute interview below. "Well yeah it was - you hit the nail right on the head there. It was 23 nights in the one bed which was phenomenal you know. I mean literally it was do the gig get in an elevator up to your room job done you know. All the energy went into the stage performance because we were on stage for the best part of two and a half hours. We'd open up for ourselves as Ded Flatbird. Do a 45 minute set of a lot of pretty obscure songs." "The first song that we did on night one was a song called Good Morning Freedom. Which was the B Side of the original seven inch single for Hello America. We hadn't played it live in 33 years. And for all the naysayers that go online that say oh they never change their set. Which is normally written by somebody that's never even been to a gig. But by the time the thing was posted up on YouTube at midnight they didn't even know what the song was called. So that was like victory for the band if you like. We were very pleased with ourselves. And it was a lot of fun because we knew that for 11 nights we were gonna be playing Hysteria in sequence as is on the album night after night. So to aleve any boredom that we'd have, we had to make sure the opening set was vastly different night after night and so we rehearsed a lot of songs. We never played the same set twice and it was a lot of fun to do." "So yeah we really enjoyed it and so much so that the promoters of the show at The Joint they want us back to do VIVA! Pyromania and we are gonna do it. But there is no set date at the moment because we are also working on a new album. And we're hoping to have that released by Spring time of next year." "And just contractually with the thing in Vegas. The first show has to be a certain amount of days after your last show of an American tour. It's just the way that the contracts are so until we know when our last show is we can't really announce Vegas. But I would imagine it would be towards the end of 2015." "We're playing rock and roll they're playing the sport. You know like the Superbowl there's always some major band on at half time. Well because it's not Superbowl, it's just a regular season game and because it's such a spectacle with it being in London, England rather than San Francisco/ With this British band that are quite big in America and what they're doing is bringing this quite big sport from America into the UK. The NFL just saw us as like I think these guys are the perfect bridge, this is what we need. So they asked us if we were interested in doing it so we said of course. We get to play for a little while before the game kicks off. And they'll be 90,000 people in the stadium and they'll be millions watching on TV so it's great exposure for the band. I'm not gonna tell you what we're gonna play of course. You've gotta wait and see for that but we're really looking forward to it."